Released on 29 November 1963, I Want To Hold Your Hand sold more than a million copies on advanced orders alone. It became the group's first US number one, and kick-started the British Invasion of America. The song was written by Lennon and McCartney in the basement of Jane Asher's parents' house in Wimpole Street, London. We wrote a lot of stuff together, one-on-one, eyeball to eyeball. Like in I Want To Hold Your Hand, I remember when we got the chord that made the song. We were in Jane Asher's house, downstairs in the cellar playing on the piano at the same time. And we had, 'Oh you-u-u... got that something...' And Paul hits this chord and I turn to him and say, 'That's it!' I said, 'Do that again!' In those days, we really used to absolutely write like that – both playing into each other's nose. At the behest of Brian Epstein, I Want To Hold Your Hand was composed with the American market in mind. I Want To Hold Your Hand is, along with She Loves You, the epitome of 1963 Beatles pop. It was recorded four days after the band's defining 13 October performance on Sunday Night At The London Palladium. In the UK the song was a standalone single; it didn't feature on the group's second album, With The Beatles, which was released a week before the single. A version of I Want To Hold Your Hand was included on the 2006 album Love. A shorter edit from the original studio recording was combined with a performance and crowd noise from the Hollywood Bowl, and the famous introduction by Bob Eubanks: "Here they are... The Beatles!" 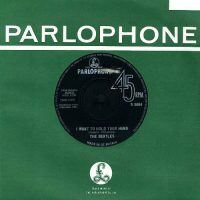 I Want To Hold Your Hand was recorded on 17 October 1963, at Abbey Road's studio two. It was the first song The Beatles recorded using four-track technology; their previous releases had been completed using just two tracks. I heard tapes recently of me counting in I Wanna [sic] Hold Your Hand, which was our first number one in the States, and I'm being pretty bossy: 'Sssh, Sssh! Clean beginning, c'mon, everyone. One, two. No, c'mon, get it right!' and I can see how that could get on your nerves. The recording was completed in 17 takes. The Beatles spent some time rehearsing the song before the tapes began rolling, and according to Beatles historian Mark Lewisohn, take one was largely the same as the final version. One early idea – take two – was to hush the vocal line "And when I touch you". Another – take four – saw Paul introduce the not uncommon 1963 Beatle 'h' into words ("Shay that shomething"). The Beatles also recorded the single's b-side, This Boy, on 17 October. Prior to both songs, however, they taped the first of seven Christmas recordings, to be given away to members of the group's fan club. The vocals were later re-recorded for the German market, as Komm, Gib Mir Deine Hand, for Electrola Gesellschaft, the German wing of EMI. This took place on 29 January 1964 at EMI's Pathe Marconi Studios in Paris, along with Sie Liebt Dich (She Loves You) and Can't Buy Me Love. I Want To Hold Your Hand/This Boy was released in the UK on 29 November 1963. Demand had been building since the success of She Loves You and the first flushes of Beatlemania. One million advance orders had been placed for the new single. On 14 December it knocked She Loves You off the number one spot – the first time the same act had replaced itself at the top of the chart. It remained at number one for five weeks, becoming The Beatles' 1963 Christmas hit, and stayed in the charts for a further 15 weeks. On 16 May 1964, during the peak of Beatlemania, it returned for a one-week return to the top. Why did they sometimes say “sh” instead of a clean “s” sound? Was it just more rock and roll or was it just joking around? Good question. I think they were trying to establish a little motif or gimmick or their own, perhaps similarly to Buddy Holly’s trademark vocal hiccups. They abandoned it pretty quickly though – I don’t think it occurs after 1963. Saying “sh” instead of “s” avoids excessive sibilance, particularly when using a close microphone. These days, of course. you can just turn on a “de-esser” effect. Geoff Emerick & Howard Massey, Here There and Everywhere: My Life Recording the Music of the Beatles (London, 2007), p. 60. It actually occurred at least once, in I am the Walrus. Listen to the line “See how they snide”. John clearly sings “See how they shnide”. well they could also have been trying to make them a bit more original, stand out ish from the rest of them. Which I thought was very cool. They were in a Ray Charles-type period. That is why they were singing with more of a “sh” sound. I doubt it, song was actually made for American audience and John was satisfied. I think John is playing acoustic guitar in this one isn’t he? No, he played his Rickenbacker 325 Capri, and Harrison played his Gretsch ‘Country Gentleman’. Interesting because on one of the Anthology videos I’m pretty sure he’s playing an acoustic guitar. I think it’s miming as well. Seems strange to mime with an instrument not even in the song. I guess he used it in the previous songs they were miming to and couldn’t be bothered changing instruments. In The Beatles as Musicians, Walter Everett claims there’s an overdubbed bass, played by Harrison. I’m not sure if it’s correct or not, but if so it’d be the first overdubbed bass on any Beatles song. According to Everett, it’s the five-note run after “…tell you something” etc in each verse, played fairly high on the fretboard so it’s within a guitar’s range. does anybody know how to achieve the rhythm guitar effect John used on this song? 🙂 thank you. Lennon used a Rickenbacker 325 with very heavy compression applied. The result knocked out most of the guitar’s dynamic range, making it sound almost like an organ. In my opinion, for anything regarding John Lennon”s guitar technique and sound go to Youtube and check out the guitar videos of a guy called msjokes. He is a fountain of practical knowledge on the Beatles’s sound. Absolutely. He has a video that is a “general” explanation of Lennon’s approach to rhythm guitar. VERY insightful and interesting! Does anyone know how many of the 17 takes were the basic rhythm track + vocals and how many were overdubs? The first overdubbed bass line in Beatles discography was “From me to you” (Listen to the solo: harmonica, guitar and bass playing the riff at the same time). In any case it must be Paul who overdubbed the bass in this song. When I first heard this song on Love I kept saying I do not remember the drums sounding this great. I think that is because they were not featured as prominently in the mix. I am not a musician but I love Ringo’s drumming on this song. I believe it was Ian MacDonald (and perhaps others) who reported that Dylan mis-heard the line “I can’t hide” as “I get high,” believing it o be about drugs. You people can NEVER get it right. Lennon’s guitar accomplished that incredible, unique sound because an RT-3 Hammond organ was fused on top of it, later added by George Martin using extreme compression and some distortion, paralleling Lennon’s 5th intervals with Chuck Berry style 6th tone where appropriate just as Martin integrated his piano with George’s 12 string on a Hard Days Night and many other tunes. I wrote Martin and he finally answered that “keyboards were probably used” on that recording although he admitted his memory was a bit spotty. There is not ONE singular example of John’s guitar, during live performances of the tune, sounding remotely close to the layered, textured sound waves emitted during the actual recording. At 8 seconds into the song, if one listens to an isolated backing track of just John’s guitar, bass and drums, you can hear the stealth organ come with low register keys to cleverly disguise itself as a guitar blending in perfectly with John’s Rickenbacker. The fact that most people either refuse to “hear” it or can’t hear it is pathetic because of the iconic image of the Fabs playing that song on Sullivan , etc., which optimized the image of their stage presentation, i.e., two guitars, bass and drums. Martin had just used the Hammond RT-3 just days before the recording of IWTHYH to superimpose it on another guitar for I Wanna Be Your Man except it was more overt with the glissando runs. For IWTHYH, he cleverly decided to mesh the organ more covertly with Lennon’s guitar to make it far more powerful considering they now had a 4 track Telefunken recorder and this was to be THE song that would break the US market, so he pulled every trick. He often “disguised” his keyboards when blending them with a guitar so here again, he worked his magic which is why it sounds so great and WHY Lennon NEVER duplicated that sound live on his guitar. Without those low key organ notes blending with Lennon’s guitar, it just would have sounded like a typical guitar as you hear on tunes like Roll Over Beethoven, Long Tall Sally (where he also does the first guitar solo and George does the second) or I Saw Her Standing There, Don’t Bother Me etc..where John hit a lot of low register root and 5th notes during chords, except for I Saw Her Standing There where he also strummed through the whole chords on E7, A7 etc.. In fact, the only released outtake of IWTHYH, which is only a partial segment, you can hear Lennon warming up his C to D opening chords and even though it has the same somewhat compressed, bassy tone, it sounds nothing like it does on the final recording and as I said, on the final, it is just John’s guitar playing the opening C to D chords but just as they start “Oh yeah I’ll”, you hear the tonality and power radically change and become far more powerful, deep and almost out of phase which is characteristic to TWO instruments. The biggest giveaways are on the B7 chords where the organ is pounding out the root and 7th tones adding a larger dimension to the just one guitar, the middle eight where John is actually playing soft open chords, Dm, G, C, Am while the organ and Pauls double stops are hitting on the 5th intervals then at the end, after John and George’s guitars stop on the G chord, its the ORGAN that slowly decays with a prominent D note ringing though on that final G chord. An isolated mix I was privy to, features John’s guitar, bass, drums and the stealth organ on track 1, meaning that after Martin added the organ on track three (or 4), he mixed it down with track one to make one fused track. Track two featured Georges lead guitar; track three featured and an additional guitar and bass overdub for the chromatic passage, an extra Lennon vocal for the middle eight, a clever dub of John & Paul singing an additional “Hand” during the crescendo of “Hand” on the refrain, and hand claps. Track four featured the final dual lead vocals of John and Paul. This the first Beatle song I ever heard. I was 7 years old when my older brother bought the 45 new in ’64. Even as a little kid, I knew something was very different about them. I played the crap out of the 45. – and I still have it. By the way – I think that the 45 of “I want to hold your hand” and flip side ” I saw her standing there” are the best combo of songs ever released on a 45 record. The version I like to hear is the first stereo mix from ’63 that is on the Singapore Greatest Hits album. That has singing out of one speaker & music from the other. Crazy? yes, but I just like hearing that for a change! Clever comment man. Probably you’re right. “Cased closed” because you say so? Nah! No evidence / documentation for your claim. Cased closed. Martin Mocha has it right. I have some outtakes of this and John’s guitar is plainly heard without the organ layer. He’s playing the Capri’s bridge pickup with the tone control turned way down giving it that woolly muffled sound. Also read somewhere George Martin’s own account of how he overdubbed the organ after the others had gone home. For many years I had been burdened with not knowing how they got that sound – couldn’t sleep, bad stomach, bad mood swings – then I found Martin’s account and my life was right again. No, you didn’t get it right with your rambling, long-winded, conspiratorial assertion. There ISN’T AN ORGAN on this track. It’s John playing his Rick probably with the pickup in the bridge position, VOX amp likely with the tone knobs set to a position cutting most of the Treble, and a high ratio of compression inserted within the console. The reason it was not replicated live is because they weren’t compressing the hell out of his guitar channel in a live situation. There you go genius. The more I listen to this song, it sounds like a single tracked John singing in unison with a double tracked John in the verses and the first middle eight. John of course, couldn’t sing both parts live, so to give the same effect, they had Paul sing with John instead. This gave people the impression that the recording must have been John and Paul as well. Beatles never put their singles on the early albums. They felt it wasn’t giving good value. The way Capitol butchered their albums until they couldn’t with Sgt. Pepper made quite a mess, putting out other albums to pick up the loose songs cut off the British versions. I’ll Get You is so amazing…when i saw play that in 2005 (did not know it was coming) it blew me away.. Of course on the current tour he’s playing Love Me Do and You Won’t See Me, which were equally mind blowing when seeing them live without being forewarned. Yeah , an absolutely massive mistake. Apart from breaking America and launching the band into the stratosphere what the hell was Martin thinking? Lennon and McCartney said they did the song “together”. But my feeling have always been that it´s more of Lennon´s kind of music than McCartney´s. In the beginning where the notes are falling to “…you´ll understand…” the interval is similar to the beginning of From Me To You (Lennon composed the A-bit) and the beginning of Tomorrow Never Knows (Lennon composition). And when they come to “…I wanna hold your hand…” they are singing on the same note, and that is typical for Lennon. After that it comes to an octave running! the climax and the most important bit in the song! very typical Lennon, similar to the running in his Please Please Me: “…it´s so hard to listen to YOU…”. The melody in the middle part “…and when I touch you…” is almost the same as the B-bit in Lennon´s Don´t Let Me Down, and the middle part in Starting Over. Perhaps Lennon wanted to exaggerate McCartney´s contribution, because Lennon was so dominant at that time. George Martin had more understanding for McCartney´s music, a music more like the popular music in the 1930s. than for Lennon´s. George Martin often misunderstood Lennon. 1964 there was released an album Off The Beatle Track with instrumental versions of Beatles songs by George Martin. In I Want to Hold Your Hand, George Martin missed the octave running — the most important bit in the song! — instead it continued on the same note. There was no octave running just a continuing on the same note!! i just listened to IWTHYH on Off the Beatle Track and could not detect the omission you speak of, probably because i’m not sure which part you refer to as the “octave running” Would love to understand better your excellent comment!! Thanks in advance. Johan is a devout John lover /Paul hater. He never cites sources or direct quotes, but somehow always seems to know what happened better than the people who were there. For instance, John and Paul both said this and From Me To You were co-composed / written…together…up each others noses (to use John’s phrase). But Johan knows better! Frankly, nothing he posts is worth investing much time in….except for the entertainment factor. I just heard the backing track and i’m pretty sure that there is a bass overdub after for example the “I’ll tell you something”. There is one thing that no one ever notices about this song. Do you know what a beat note is? It is usually heard when tuning a guitar. Two almost identical notes are struck at the same time and they beat against each other until they are in tune. Then the beating stops. Let’s say you are playing an A 440 and you also play a slightly flat A 437. You will hear three beats per second. As you tune the flat note up to A 438 it will give you two beats per second and at A 439 you get one beat per second. Once they are in tune the beating stops. Now listen to Paul and John singing “I can’t hide” at 1:08 to 1:10 and you can hear their voices beating like crazy. It happens at 1:49 also. This is the only time I have ever heard singing beating. It helps to listen in headphones. What on earth is an A440 or A437 ? Hi Jack. A-440 is the A above middle C. If you strike a standard A tuning fork, it is an A-440 or 440 vibrations per second. An octave higher is A-880. A above middle C is used when an orchestra tunes up since all the string instruments have an open A string. The phenomena of beats occurs when almost the same note is played simultaneously by two sources. As you say, the notes need to differ only very slightly by a few Hz in frequency. In other words they have to be very close in pitch. Since John and Paul are singing different notes entirely, notes that differ by a much larger difference in frequencies ( they are harmonizing after all) and at completely different pitches, then what you are hearing is not the phenomena of beats. I think you are hearing Ringo’s bass drum doubling up at these points. Either that or you are smoking some strong stuff. John and Paul sang the song together as they did live. The myth keeps growing about Lennon being more dominant in the beginning. He wasn’t. Paul played guitar and piano. John learned, although never could play keyboard well. I’m a fan of both but listen to the outtakes of I want to hold your hand. You can hear who the boss was. Listen to the Quarryman talking about Paul. They would know. John say more than once Mccartney had quite a few songs before the Beatles. To me it sounds like it is Paul who is singing the opening line of this song, yet somehow it morphs into John’s voice. Iconic hit that was their first US number one. Great guitar opening and Lennon-McCartney duet. I also love it’s flip side “This Boy”. The idea of using a v-minor chord as a temporary ii minor in a new key is as old as the hills. I’m sure Paul heard this change many times as he seemed to love the old standards. Actually, the voice introducing the Beatles at the Hollywood Bowl is that of Bob Eubanks, a DJ in the LA area in the 1960's and later, host of the TV game show, The Newlywed Game. Thank you! I’ve corrected it now. Bob Eubanks – also the promoter of the Beatles’ H-Bowl concerts. Reportedly, he took a second mortgage on his house to finance the ’64 show. Did John recorded this on a Gibson J-160E or Rickenbacker 325? I don’t know why, but although many people believe it’s the Rickenbacker, some people believes that it’s actually the Gibson plugged in to an amp. I’m very confused. smacked up side of the head. By the time “She loves you” and “Please please me” hit, I was a hopeless, molten pool of Beatles love. Hey folks. Here is a scoop which if JL was still around he would confirm. The joker that he was, very flippant, sings I want to hold your HAM, not hand. Happens three or four times during the song. Ham is english for a female body part. Oooh that Lennon. Always keeping us on our toes. Imagine if he had been asked about this when the song came out or at the Beatles press conference at Kennedy. Ouch!!! Give a listen folks. As you say it happens three or four times, meaning not every time, can you point out the time stamps of these? I personally couldn’t hear it with head phones. All I hear is a drawn out “haaaand” or at most what sounds like “haaaaan” with the d clipped. Ham is not English for a female body part. You have just made that up.